Having become entirely nous Atticus towards the invisible Minds. According to the historian Sozomen: "Many candidates were proposed as the successor of John Chrysostom; and four months after his decease, Atticus, a presbyter, of the clergy of Constantinople, and one of the enemies of John, was ordained. He was a native of Sebaste in Armenia. He had been instructed from his youth in the principles of monastic philosophy by monks of the Macedonian heresy. These monks, who then enjoyed a very high reputation at Sebaste for philosophy, were of the discipline of Eustathius, to whom allusion has been already made as bishop there, and a leader of the best monks. When Atticus attained the age of manhood, he embraced the tenets of the Catholic Church. He possessed more by nature than by learning, and became a participant in affairs, and was as skillful in carrying on intrigues as in evading the machinations of others. He was of a very engaging disposition, and was beloved by many. The discourses which he delivered in the church did not rise above mediocrity; and although not totally devoid of erudition, they were not accounted by his auditors of sufficient value to be preserved in writing. Being intent, if an opportunity offered itself anywhere, he exercised himself in the most approved Greek authors; but lest, in conversation about these writers, he might appear unlettered, he frequently concealed what he did know. It is said that he manifested much zeal in behalf of those who entertained the same sentiments as himself, and that he rendered himself formidable to the heterodox. When he wished he could easily throw them into alarm; but he at once transformed himself and would appear meek. Such is the information which those who knew the man have furnished." The historian Socrates further writes of him: "When Theodosius the emperor was in the eighth year of his age, Atticus was in the third year of his presidency over the Church at Constantinople, a man as we have by anticipation said distinguished alike for his learning, piety, and discretion, wherefore it came about that the churches under his episcopate attained a very flourishing condition. For he not only united those of 'the household of faith' (Galatians 6:10), but also by his prudence called forth the admiration of the heretics, whom indeed he by no means desired to harass; but if he sometimes was obliged to impress them with the fear of himself, he soon afterward showed himself mild and clement toward them. But indeed he did not neglect his studies; for he assiduously labored in perusing the writings of the ancients, and often spent whole nights in the task; and thus he could not be confused by the reasonings of the philosophers, and the fallacious subtleties of the sophists. Besides this he was affable and entertaining in conversation, and ever ready to sympathize with the afflicted: and in a word, to sum up his excellences in the apostle's saying, 'He was made all things to all men' (1 Corinthians 9:22). Formerly while a presbyter, he had been accustomed, after composing his sermons, to commit them to memory, and then recite them in the church: but by diligent application he acquired confidence and made his instruction extemporaneous and eloquent. His discourses however were not such as to be received with much applause by his auditors, nor to deserve to be committed to writing. Let these particulars respecting his talents, erudition, and manners suffice." Thus in the year 406 Atticus was elected Patriarch of Constantinople, during the reign of the Emperor Arcadius, as a successor of Patriarch Arsacius, all three of which were responsible for the violent expulsion of Saint John Chrysostom on 10 June 404 and a division in the Church of Constantinople. Unity seemed hardly nearer when the death of Chrysostom (14 September 407) removed the original ground of the schism. A large proportion of the Christian population of Constantinople still refused communion with the usurper, and continued to hold their religious assemblies, more numerously attended than the churches, in the open air in the suburbs of the city, until Chrysostom's name took its place on the registers and in the public prayers of the Church of Constantinople. Thus his best-known single act is his restoration of the name of Saint John Chrysostom to the diptychs in 413, which not only corrected a grave injustice but healed a schism. 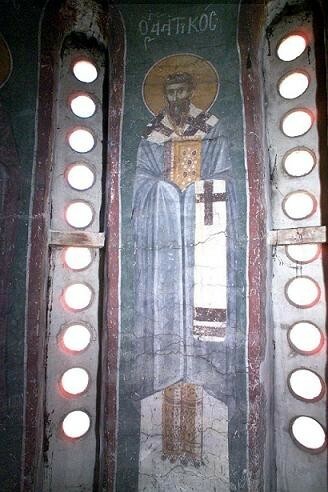 Saint Atticus also presided over the rededication of the small church that stood on the site of the future Hagia Sophia, which had been burned in 404 in the rioting that followed Saint John Chrysostom's exile. Atticus served as shepherd to the Church of Constantinople for twenty years, ruling always with wisdom and moderation. Though he was unbending in upholding the Orthodox faith exactly, he took a conciliatory, persuasive approach to heretics and schismatics; in this way he was able to restore many to the Church rather than driving them away. He displayed great vigor in combating and repressing heresy. He wrote to the bishops of Pamphylia and to Amphilochius of Iconium, calling on them to drive out the Messalians. The zeal and energy he displayed against the Pelagians are highly commended by Pope Celestine I, who goes so far as to style him "a true successor of Chrysostom". He gained popularity among the people of Constantinople, by being an opponent of Pelagianism. His writings were quoted as those of an orthodox teacher by the Synods of Ephesus (431) and Chalcedon (451). Socrates further relates the following miracle: "A certain Jew being a paralytic had been confined to his bed for many years; and as every sort of medical skill, and the prayers of his Jewish brethren had been resorted to but had availed nothing, he had recourse at length to Christian baptism, trusting in it as the only true remedy to be used. When Atticus the bishop was informed of his wishes, he instructed him in the first principles of Christian truth, and having preached to him to hope in Christ, directed that he should be brought in his bed to the font. The paralytic Jew receiving baptism with a sincere faith, as soon as he was taken out of the baptismal font found himself perfectly cured of his disease, and continued to enjoy sound health afterwards. This miraculous power Christ vouchsafed to be manifested even in our times; and the fame of it caused many heathens to believe and be baptized. But the Jews although zealously 'seeking after signs' (1 Corinthians 1:22), not even the signs which actually took place induced to embrace the faith. Such blessings were thus conferred by Christ upon men." "Meanwhile Atticus the bishop caused the affairs of the Church to flourish in an extraordinary manner; administering all things with prudence, and inciting the people to virtue by his instruction. Perceiving that the Church was on the point of being divided inasmuch as the Johannites assembled themselves apart, he ordered that mention of John should be made in the prayers, as was customary to be done of the other deceased bishops; by which means he trusted that many would be induced to return to the Church. And he was so liberal that he not only provided for the poor of his own parishes, but transmitted contributions to supply the wants and promote the comfort of the indigent in the neighboring cities also. On one occasion as he sent to Calliopius a presbyter of the church at Nicæa, three hundred pieces of gold he also dispatched the following letter. Atticus to Calliopius — greetings in the Lord. I have been informed that there are in your city ten thousand necessitous persons whose condition demands the compassion of the pious. And I say ten thousand, designating their multitude rather than using the number precisely. As therefore I have received a sum of money from him, who with a bountiful hand is wont to supply faithful stewards; and since it happens that some are pressed by want, that those who have may be proved, who yet do not minister to the needy — take, my friend, these three hundred pieces of gold, and dispose of them as you may think fit. It will be your care, I doubt not, to distribute to such as are ashamed to beg, and not to those who through life have sought to feed themselves at others' expense. In bestowing these alms make no distinction on religious grounds; but feed the hungry whether they agree with us in sentiment, or not. Thus did Atticus consider even the poor who were at a distance from him. He labored also to abolish the superstitions of certain persons. For on being informed that those who had separated themselves from the Novatians, on account of the Jewish Passover, had transported the body of Sabbatius from the island of Rhodes — for in that island he had died in exile — and having buried it, were accustomed to pray at his grave, he caused the body to be disinterred at night, and deposited in a private sepulchre; and those who had formerly paid their adorations at that place, on finding his tomb had been opened, ceased honoring that tomb thenceforth. Moreover he manifested a great deal of taste in the application of names to places. To a port in the mouth of the Euxine sea, anciently called Pharmaceus, he gave the appellation of Therapeia; because he would not have a place where religious assemblies were held, dishonored by an inauspicious name. Another place, a suburb of Constantinople, he termed Argyropolis, for this reason. Chrysopolis is an ancient port situated at the head of the Bosphorus, and is mentioned by several of the early writers, especially Strabo, Nicolaus Damascenus, and the illustrious Xenophon in the sixth book of his Anabasis of Cyrus; and again in the first of his Hellenica he says concerning it, 'Alcibiades having walled it round, established a toll in it; for all who sailed out of Pontus were accustomed to pay tithes there.' Atticus seeing the former place to be directly opposite to Chrysopolis, and very delightfully situated, declared that it was most fitting it should be called Argyropolis; and as soon as this was said it firmly established the name. Atticus had moreover a presentiment of his own death; for at his departure from Nicaea, he said to Calliopius a presbyter of that place: 'Hasten to Constantinople before autumn if you wish to see me again alive; for if you delay beyond that time, you will not find me surviving.' Nor did he err in this prediction; for he died on the 10th of October, in the 21st year of his episcopate, under the eleventh consulate of Theodosius, and the first of Valentinian Caesar. The Emperor Theodosius indeed, being then on his way from Thessalonica, did not reach Constantinople in time for his funeral, for Atticus had been consigned to the grave one day before the emperor's arrival. Not long afterwards, on the 23d of the same month, October, the young Valentinian was proclaimed Augustus." He reposed in peace in 425.